Today’s post is a little nostalgic for me, these strawberry napoleons are one of the first things I ever baked for my husband. Looking back on it, I was so proud of this dessert. Proud and so pleased with how fancy and elegant these fresh spring strawberry napoleons are. They sound exotic, right? And they taste it too. Flaky puff pastry layered with fresh strawberries and Bavarian cream, then topped off with a perfect swirl of Reddi-wip®. They’re light and fresh, but oh so indulgent. I’ve been making them ever since, rightly so, since they’ve earned a spot on the list of my husband’s favorite spring desserts. 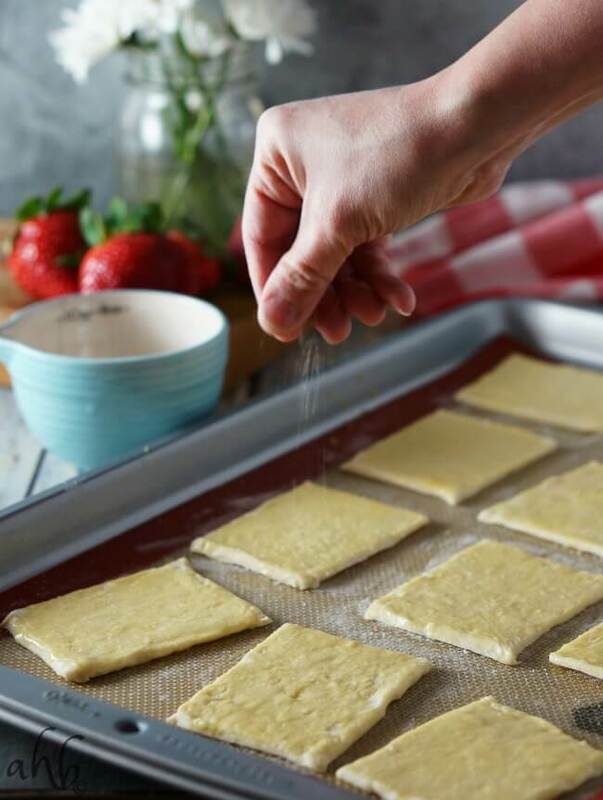 Any time I bring a tray of strawberry napoleons to a gathering it usually elicits a few oohs and ahs, but here’s the big secret about these…they are ridiculously quick and easy to whip up! 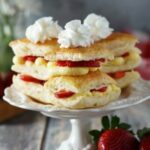 Seriously, strawberry napoleons are easy enough for anyone to make, even your little budding bakers. The first step of the napoleons is to make the filling. The Bavarian cream can even be made a day or two ahead of time if you wish to simplify the process and save time. Simply whip together vanilla instant pudding, heavy cream, vanilla, almond extract and chill. You might be tempted to skip the almond extract, but don’t! It really transforms the vanilla pudding from so-so to amazing! To make assembly easier, I spoon my Bavarian cream into a disposable pastry bag and refrigerate it until it’s time to use, then just snip off the corner and pipe onto the shells. Next we’ll prepare the puff pastry. Take one sheet of puff pastry and cut it into 12 squares. I always brush my puff pastry with an egg wash and sprinkling of sugar for beautifully shiny, sweet tops. While the pastry is baking and cooling, you can slice your strawberries and give them a sprinkling of sugar also. Once you’ve got your puff pastry baked and Bavarian cream prepared, it’s time to assemble! Split the puff pastry squares in half, reserving 8 tops to side. Pipe Bavarian cream onto 8 bottom pieces of puff pastry, place a heaping spoon of strawberries on top of the cream. Place another piece of puff pastry on top and repeat the layers. Finish each napoleon off with one of the 8 tops reserved and of course, a dollop of cool creamy Reddi-wip whipped topping! 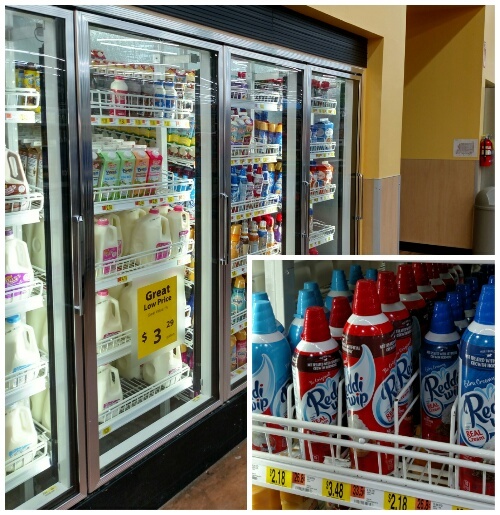 Every dessert is better with a dollop of Reddi-wip from the dairy section at Walmart. These strawberry napoleons make an impressive, but oh so easy, addition to the dessert table that screams spring. If you love spring baking, there are some gorgeous recipes over at #SpringReddi sure to inspire and excite you. What’s your favorite spring dessert? 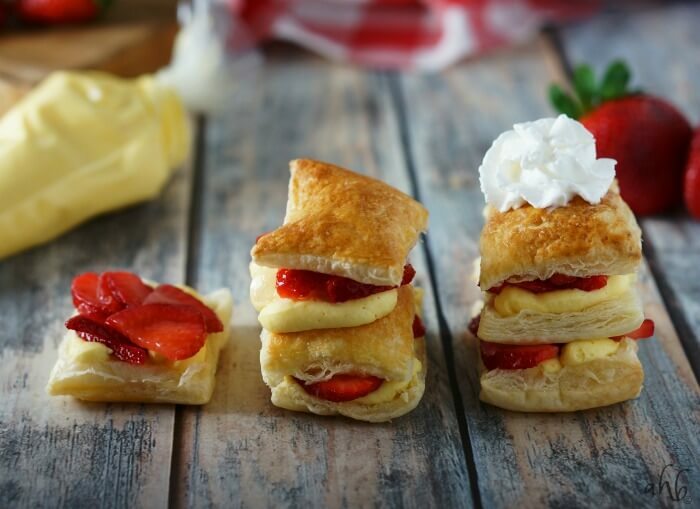 Flaky puff pastry layered with fresh strawberries and an easy to make Bavarian cream. Sprinkle the strawberries with 1 teaspoon of sugar and let sit. In a medium sized mixing bowl beat together the pudding, cream, milk, vanilla and almond extract until thick and smooth. Transfer to a pastry bag or a large ziplock bag and place in fridge. Unfold the puff pastry and cut into 12 squares. Place on a parchment or silpat lined baking sheet. Whisk together the egg and water, then lightly brush each square with the egg wash. Lightly sprinkle with 1 teaspoon of sugar and bake at 400 for 14- 16 minutes. Let the puff pastry cool completely. Divide each piece in half. Reserve 8 of the tops to the side. Pipe Bavarian cream onto 8 bottom pieces, then place a heaping spoon of strawberries on top of the cream. 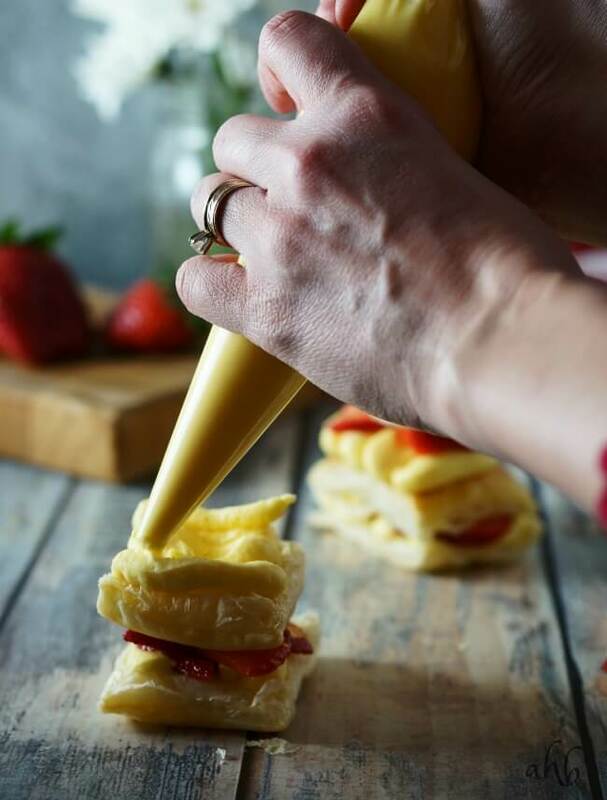 Repeat the layers starting with another piece of puff pastry, then Bavarian cream and strawberries. Top each napoleon with one of the reserved tops and finish with a dollop of Reddi-wip before serving. These look fab and just in time for spring! I won’t have to talk anyone into eating their fruit when I use this delicious recipe! Beautiful & proof that spring has to be around the corner. Nope, there’s definitely no arm twisting with this one. That is, unless you are wanting to save one for yourself! I didn’t end up getting to eat a single napoleon from this batch. My family devoured them before I had a chance. I agree! Nothing like fresh strawberries and cream. It will never ever go out of style. These are so beautiful– I am loving all the strawberries popping up around the web. It means spring is finally here! Me too! Strawberries and daisies just scream spring. I couldn’t pass up the opportunity to have both in my kitchen and you know, they made me smile the whole day long. 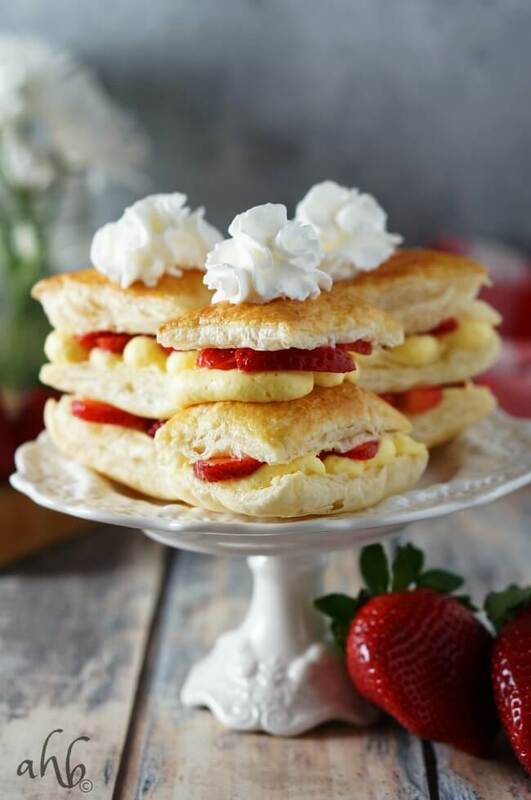 You should be proud of these Strawberry Napoleons – they look absolutely gorgeous! 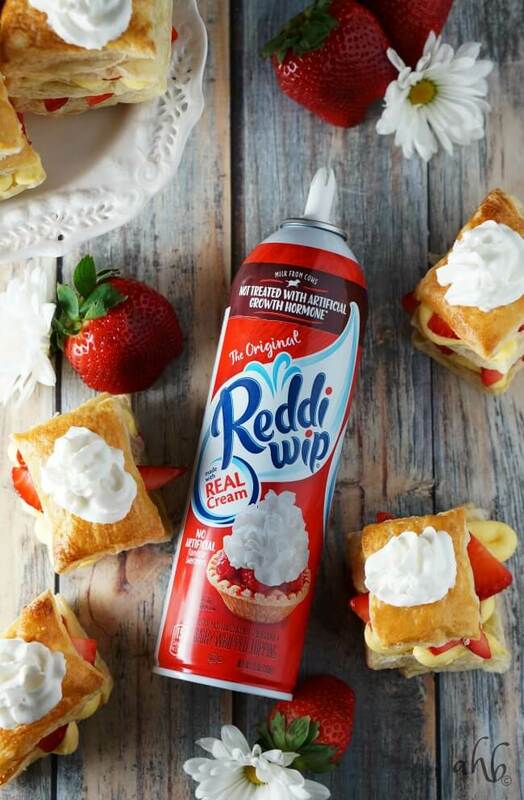 Love how you used the Reddi-wip – what a delicious shortcut!